Canon 7D with main battery removed. I purchased a factory refurbished Canon EOS 7D digital SLR camera several years ago. It’s worked great and I’ve been pleased with it—and I’m still using the original proprietary battery pack. Several weeks ago I’d picked it up after several months of disuse and tried to turn it on. The camera was dead. I wasn’t too surprised, so I pulled the battery and put it into the charger. After a charge I put it back into the camera. Still wouldn’t turn on. Pulled the battery again and placed it back into the charger, which thought it was fully charged. Hmm. After reinstalling the battery and futzing around a bit I finally got the 7D to turn on, but with an error message on the display: “Cannot communicate with battery. Use this battery?” I selected ‘Yes’ and was able to use the camera, but there was no feedback as to the battery’s charge level on the status display. 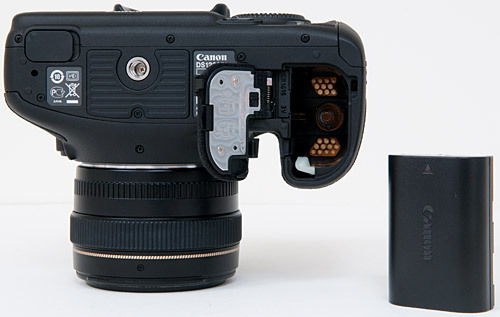 It turns out this is a common problem with the camera, and the most common solution is to return the unit to Canon with a $250 payment for repair. Although the problem seems widespread Canon has not enacted a recall. This is an unsatisfactory situation and seems to me like a money grab by Canon. I wondered whether or not the battery contacts (on the battery itself or the contacts within the camera) had become fouled. I removed the main battery from the camera as well as the memory backup coin cell (a CR1616) from the battery compartment. Next I dug out my trusty can of Caig Laboratories Deoxit D5 (available at most fine electronic parts retailers, or at Parts Express and MCM Electronics) and some cotton swabs. 1) Remove the main battery from the camera and look at the flat side. You’ll see two silver rectangular contacts side-by side. There are also two side-by-side slots halfway between the left and right sides on the same end of the battery. There are contacts within these slots as well. 2) Wet one of a cotton swab with Deoxit. It should be damp when you’re finished, but not dripping wet. DO NOT SPRAY DEOXIT DIRECTLY INTO THE CAMERA OR ONTO THE BATTERY. 3) Look into the camera’s battery compartment, using the location of the contacts on the battery itself to guide you as to where to apply the Deoxit. 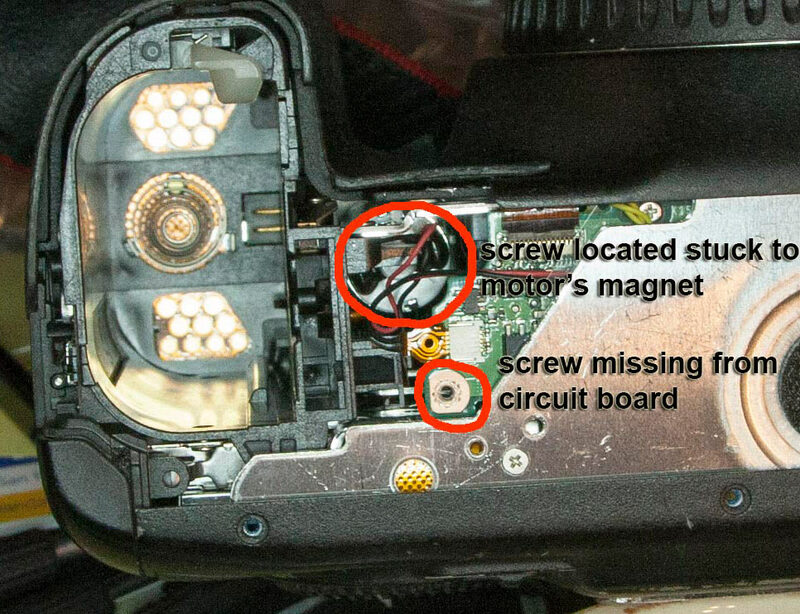 NOTE: when looking into the camera you’ll see a lot of copper-colored circles at the bottom of the battery compartment, as shown in the photo above. THESE ARE NOT BATTERY CONTACTS. The contacts will be on the wider, flat side of the compartment down close to the spring. Wipe the four contacts with Deoxit. 4) Now wipe the battery contacts with Deoxit. For the contacts in the slots, you may have to pull and shape the cotton on the swab to make it thinner and flatter. Alternatively, you can take a corner of a paper towel and fold it several times, spray it with a little Deoxit and work the towel into the slots. 5) Re-insert the battery into the camera, but pull the white latch to the side with one finger and hold it while you repeatedly push the battery in and allow the spring to pop it back out again. Do this fifteen or twenty times to help polish the contacts and ensure they’re coated with Deoxit. When finished remove the battery and set it aside for ten minutes or so. 6) Take the opportunity to remove the CR1616 coin cell from the battery compartment and change it if you’ve never done so. With the carrier that holds the coin cell out of the camera you can see two sets of silver contacts in the slot. Wipe those with Deoxit, then carefully insert and remove the battery/carrier a few times. (This battery’s contacts aren’t as robust as the other set so be careful.) When finished, insert and leave the coin cell in the camera. 7) The last step is to insert the main battery and try turning the camera on. You may still have to futz around with the controls a bit for the first turn-on cycle; I didn’t. You should be greeted by a prompt to change the time and date. Fortunately this routine allowed me to resuscitate my camera and one week out it’s still working. Now what could possibly have caused the issue? My theory is that some small amount of gasses produced by the battery’s internal chemicals may have escaped and fouled the contacts as the battery slowly discharged inside the camera. Perhaps this is why it’s recommended to remove the batteries from your electronics when they’re not being used for a period of time. In the future I intend on following that advice. If this helped you please pass it on. Why should anyone spend $250 that they don’t have to? This blog post has gotten a lot of interest since it was published! I have a few updates for you. 1) The first additional screw is black, and is directly below the lens mount on the bottom of the camera. You can’t miss it. 2) The second screw is below the rubber grip, near the lens and closest to the bottom of the camera. It’s a silver screw. Now for my own experience…I purchased my camera several years back as a Canon factory refurb. When I opened the camera the screw was firmly in place. Gentle tapping on the table did not produce any other loose screws from the camera’s guts. Despite this it developed the battery communication issue as I had described. There may still be some validity to my theory of battery outgassing, but the loose screw issue may be the primary cause of the 7D’s problem. I wonder if the new 7D Mark II will have this same problem?